Every new model Volvo introduces starting in 2019 will be an electrified Volvo, the company said. That doesn’t mean Volvo’s doing away with internal combustion engines. Rather, all new models of Volvo cars, station wagons and SUVs introduced after the end of next year will have an electric motor – some to augment the internal combustion engine, others running as all-electric vehicles. While at least five new Volvo models will be all-electric, others will be “mild hybrids” utilizing 48-volt batteries and small electric motors. A micro- or mini-hybrid system enables a car to shut down rather than idle when stopped and provides a brief electric boost to help get the vehicle rolling. Other electrified Volvo models will be plug-in hybrids, such as the current XC90 T8 PHEV. Plug-in hybrids typically are capable of a limited amount of highway speed driving in all -electric mode before discharging their batteries and operating as conventional hybrids. The company said that in conjunction with the electrification strategy it will reintroduce its “Polestar” performance division as a standalone nameplate. Volvo said it plans to have at least five all-electric models by 2025. Three will be Volvos while two will carry the Polestar name. The initial Volvo EV, to be released in 2019, will be a small car, based on the upcoming XC40 crossover, and will be sold globally. It will be priced at or below $40,000, positioned as a competitor to the Chevrolet Bolt and upcoming Tesla Model 3 EVs. Volvo is a small player in the U.S. – accounting for less than 1 percent of total new car sales here last year. But it has a larger presence in Europe and Asia, where government regulation of vehicle emissions is prompting many automakers to consider increased electrification as a strategy. China presently accounts for almost half of all hybrid and electric car sales. Volvo has been owned by Chinese automaker Geely since 2010 and Geely says it wants to be a major supplier of electrified cars. Volvo’s decision to electrify all future models will help it establish a front-runner role in what is still a small part of the passenger vehicle market. Hybrid and electric cars accounted for about 3 percent of global automotive sales last year. 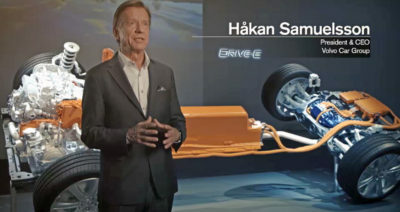 But an electrified Volvo it is not just a marketing ploy, the company said. Volvo is committed to reducing its carbon footprint and plans to have a million electrified models on the streets by 2025.